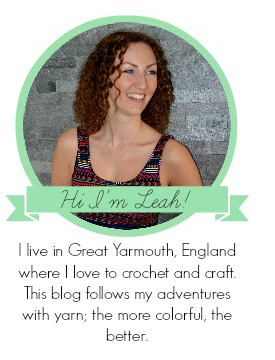 Curly Girl Coop: Fresh Stitches Kit Club Big Reveal! As if going to Yarndale wasn't exciting enough, the day I was driving up to Yorkshire I also received my Fresh Stitches Kit Club through the post. I love this idea. Every other month, a mystery item is sent through the post. It features a Fresh Stitches pattern, plus everything you need to make your cuddly (except stuffing) and a mystery gift to make your toy something special, more than just your regular singlet crochet. In past kit clubs, this has included beading and working with pipe cleaners all supported on Stacey's website so you know exactly what to do with it to make sure it turns out super cute! As I'd enjoyed my other kit clubs so much in the past, I signed up for this year's one and waited patiently for my kit to arrive. It's tougher than you would think; as Stacey's followers are spread all over the world, some receive their kits much before I do. It's so tempting to snoop around on the internet to find out what's in the package, but I resisted this time, making sure it stayed a surprise right until I opened the box. And what a great surprise it was! When I ripped open the box, I have to admit my first thought was "A teddy bear made from plain yarn, is that it?" but of course it wasn't. As I dug out all the bits and pieces I realised that tucked under the pattern was the part that suddenly made it all very fun. Kool-Aid sachets. Kool-Aid is particularly exciting to me as it's not something we have here in the UK so it's been one of those things on my list of things to track down, that I never really got round to doing. In case you haven't heard of it, Kool-Aid is a drink (!) in America, a bit like the squash we have over here. 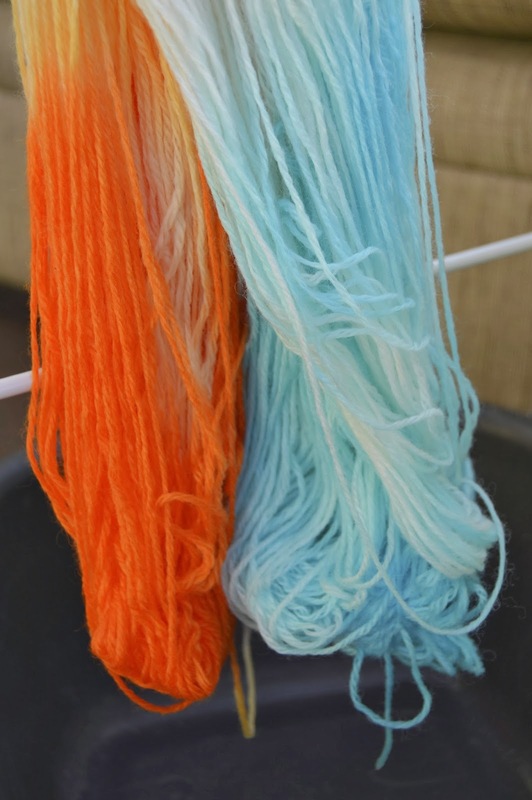 After Yarndale, I eagerly watched Stacey's video to get set in my mind what I needed to do, then gingerly emptied the contents of the sachets into two separate bowls; one blue, one orange. The colours were soooo vivid! There are two packets of orange here with one blue. And the smell! A wonderfully sweet fruity smell filled the house once the water was added. 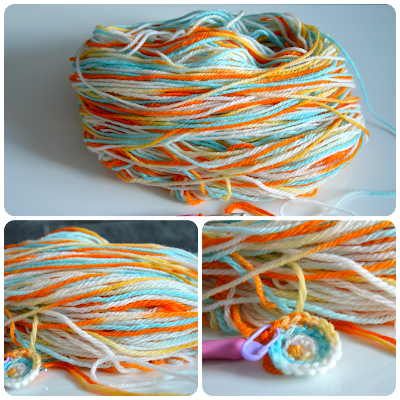 What I hadn't anticipated was how quickly the dye is slurped up by the yarn. The video had warned the yarn was dye hungry as it was untreated animal wool, but wow this was fast! Within perhaps two seconds of tentatively laying the wool in the dye mixture it was gone! I was a bit shocked by this; I had expected to have to poke it around a bit to get it to take to the dye (I had only just finished my yarn dyeing workshop at Yarndale and was thinking of how things had taken there) so hadn't arranged the yarn quite as I might have liked. I tried adding a little bit more water to see if I could dilute the dye to make it go a little further, but as you can see any water I added had no colour. I think this is because you use boiling water to make up the dye, it instantly sets the colour so it doesn't leak at all. I rinsed the yarn well under cold water, but very little dye came out. A good rinse also makes sure your yarn won't be crispy when you come to work with it, so it's worth taking a little time over it. After a thorough squeeze, I had to sit back and wait for the yarn to dry, so I left it hanging in my conservatory, and crossed my fingers that Squitchy wouldn't notice it was there. I was so pleased with how it turned out! Not only are there those really bright, bright colours, but there's also some more subtle in-between shades in there too. It worked up really nicely, although next time I would try to think of my colour repeat a bit more. What Ive found is that for the teddy's arms and legs, the colour repeat means that one side is really colourful whilst the other side is almost plain. To try and alter this, I guess I would have to know how much yarn is used in one stitch for example, and then decide how many stitches I want each colour to be, to either make a repeating pattern, or completely avoiding it. It would take a bit of planning, and to be honest, I quite like the random look! Teddy, the Bear didn't turn out quite as cute looking as I had hoped. I can't quite put my finger on exactly what I'm not happy with, but there's definitely something. I am, however, very pleased with the effect of Kool-Aid dye and I can't wait to get some more colours so I can experiment in the future. 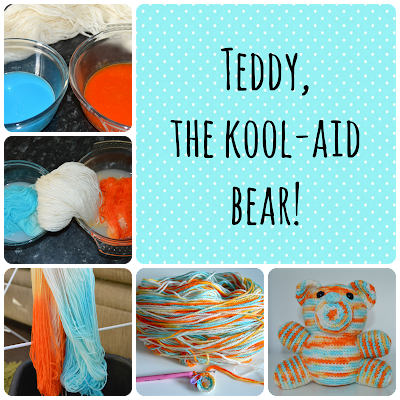 Have you ever tried Kool-Aid dyeing? Do you have any tips for me? I just discovered this post now (a bit late, I know...), but I LOVE it! And I think your bear is adorable!